This potato salad reminds me of a trip to Vienna some years ago now when we visited a restaurant which claimed to serve the largest and best Wiener Schnitzel in the city. A claim which isn’t unsubstantiated. 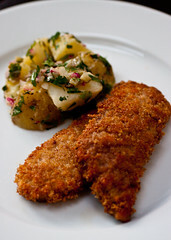 The schnitzel are simply served with a potato salad and a green salad. This is my take on the delicious Figlmuller potato salad. Serve yours with an escalope of veal, pork, chicken or even homemade fish fingers. Also great with cold meats.